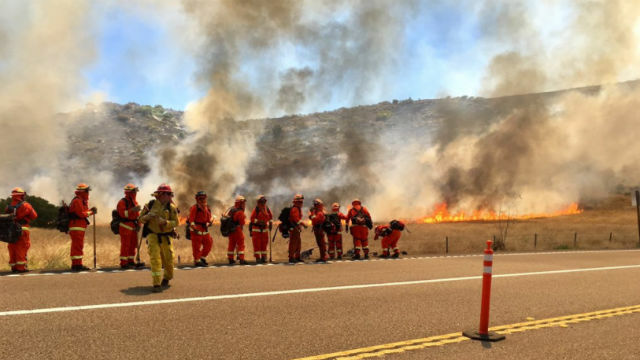 A fast-moving brush fire that broke out south of Jamul late Saturday morning near state Route 94 has grown to about 1,500 acres with 30 percent containment and caused the closure of the main route between Jamul and Dulzura. The fire was reported at 11:20 a.m., and the cause has not yet been determined, according to Capt. Issac Sanchez of Cal Fire. It was primarily burning in grass with some sparse brush. The California Highway Patrol closed SR 94 in both directions from Honey Springs Road to state Route 188. Otay Lakes Road was also closed from state Route 94 to the south. The CHP’s web site said the caller reported the fire atop Otay Mountain. Six fire engines, one helicopter, two air tankers, two water tenders, four hand crews and an air tactical aircraft from Cal Fire were initially assigned to fight the fire, Sanchez said. 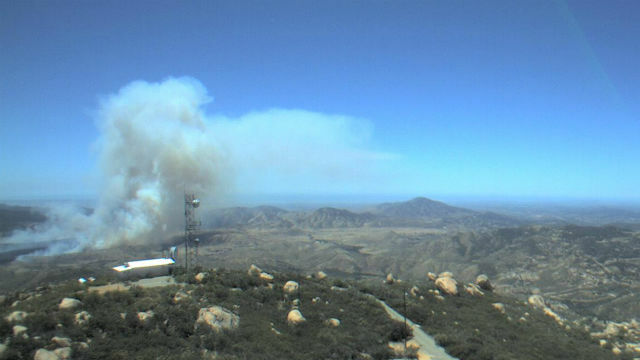 U.S. Forest Service personnel also responded, along with firefighters from Lakeside, Santee and Viejas. The Los Angeles County Fire Department sent four camp crews, four superintendents and a battalion chief and the Orange County Fire Authority sent a strike team for mutual aid, according to officials from those agencies. The fire was reported to be about 10 acres in size when firefighters arrived, but quickly grew at a “dangerous rate of speed,” Sanchez said. Hot, dry and windy conditions and rugged terrain helped the fire grow to 300 acres by 1 p.m., then 425 acres about an hour later. It doubled in size by 5 p.m. Saturday. Officials evacuated the nearby Thousand Trails Pio Pico Campground as a precaution to the Eastlake Walmart parking lot in Chula Vista, but the fire was not expected to reach there. Dulzura was under an evacuation warning with the Viejas Casino parking lot the temporary evacuation point. Smoke from the fire could be seen for miles. It was dubbed the “Gate Fire” because of its proximity to a pink gate along the highway that leads to an access road, according to Sanchez. No firefighter injuries were reported, but a Chula Vista police officer was seriously injured while directing traffic at a street closure. There was no word when the fire would be extinguished.